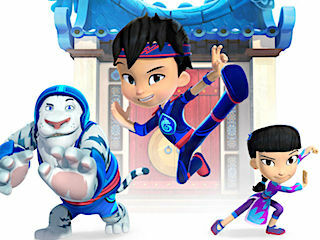 While visiting his grandparents' village in China, a 9-year-old Chinese-American boy learns that he is next in line to become Village Defender, wielding the Sapphire Dragon against the evil Mogo and his monkey minions. 1. 1-1                 07 Aug 17   Temple Kapow! / Dance Kapow! 2. 1-2                 07 Aug 17   Dumpling Kapow! / Noise Kapow! 3. 1-3                 08 Aug 17   Kite Kapow! / Tunnel Kapow! 4. 1-4                 09 Aug 17   Bunny Kapow! / Robot Kapow! 5. 1-5                 10 Aug 17   Birthday Kapow! / Sneeze Kapow! 6. 1-6                 12 Aug 17   Lantern Kapow! / Fireworks Kapow! 7. 1-7                 13 Aug 17   Itchy Kapow! / Water Works Kapow! 8. 1-8                 19 Aug 17   Tuk Tuk Kapow! / Stinkbug Kapow! 9. 1-9                 26 Aug 17   Snowy Kapow! / Dragon Egg Kapow! 10. 1-10                02 Sep 17   Berry Kapow! / Goggles Kapow! 11. 1-11                09 Sep 17   Mini Mogo Kapow! / Treasure Map Kapow! 12. 1-12                16 Sep 17   Basketball Kapow! / Music Kapow! 13. 1-13                23 Sep 17   Ostrich Kapow! / Bigville Kapow!